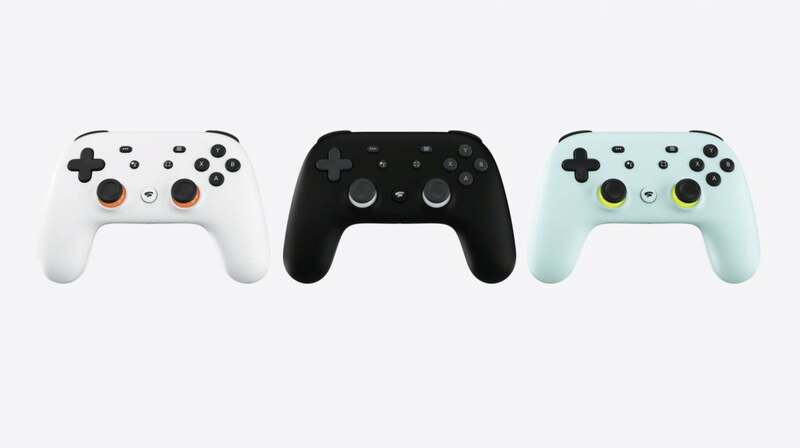 At GDC 2019, Google took the wraps off its hotly rumored Stadia game-streaming service and a companion controller. It looks pretty wild—and bandwidth intensive. It’s safe to say that going into GDC 2019, Google’s Tuesday morning keynote was the most anticipated on the schedule. Rumors have flown for weeks, though calling them “rumors” is perhaps underselling it. 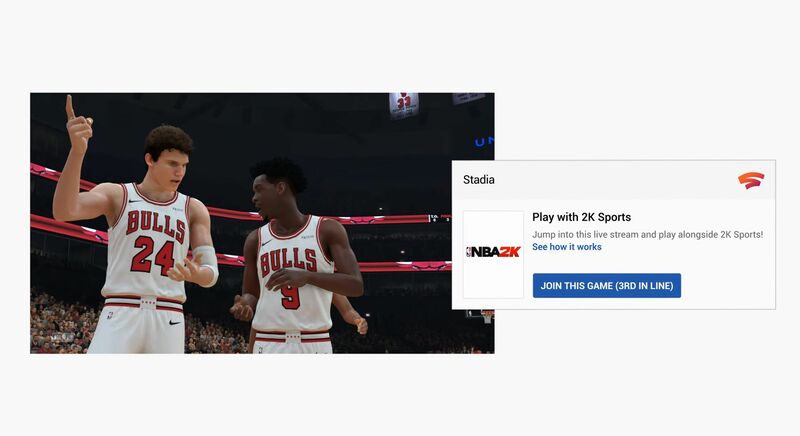 We knew Google was working on streaming games to the Chrome browser, after last year’s Project Stream tests, and it was clear we’d see more about those ideas here. Tuesday was the official reveal though. It’s called Stadia, and already the old box-under-the-TV paradigm feels outdated. “Building a game platform for everyone.” That’s the tagline Google went with during its presentation. You have a desktop? A laptop? A phone? Then you have Stadia. It’s that easy. This is the future that game streaming allows. No, seriously: Google showed it to us. An onstage demo went from laptop to phone to desktop to TV, picking up and playing the same Assassin’s Creed: Odyssey save file with mere seconds in between each platform. As long as you have Chrome and a strong Internet connection, you’re ready for Stadia. 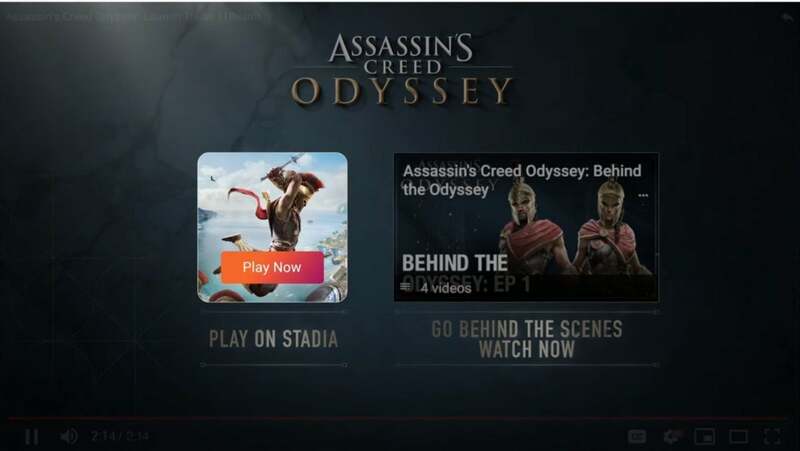 Hell, Google showed how someone could watch the Odyssey trailer, click a “Play Now” button below, and within seconds start running around the game—no need to install, no need for patches, none of the pain points associated with modern gaming. These aren’t new ideas, of course. OnLive tried to do this a decade ago. Sony’s been doing it with PlayStation Now as well. But Google has a few advantages—namely, a worldwide server infrastructure that ensures you’re never too far from a data center, plus an install base that spans billions of devices. And so Stadia is a step above what we’ve seen from previous iterations of this concept. Last year’s Project Stream tests were already impressive, allowing you to play Odyssey at 1080p and 60 frames per second. 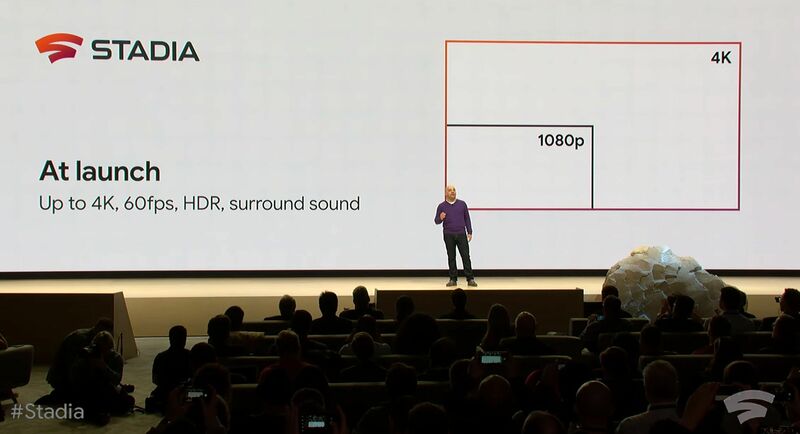 Stadia will kick that up to 4K, and also will stream HDR and surround sound data as well. In theory it should be indistinguishable from playing the game on a local machine. Or better. And that’s the real promise of game streaming, and the key to Google’s “Building a game platform for everyone” mantra. At the moment, a high-end PC might run you $1,500 or more. 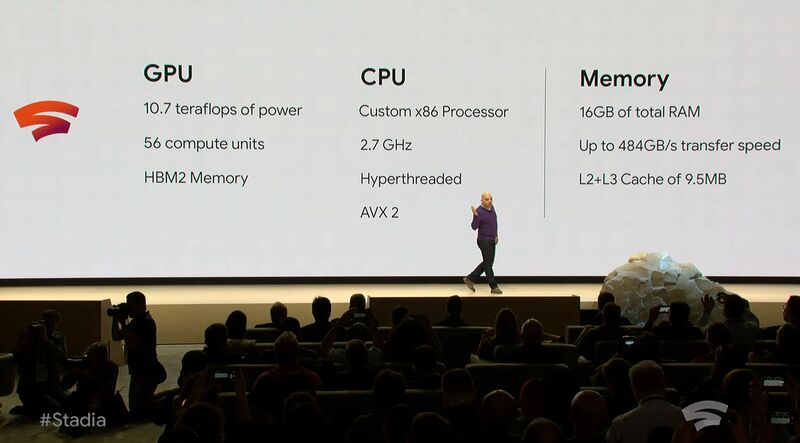 With Stadia, Google’s doing the heavy lifting in its data center, which means you can—again, in theory—experience maxed-out graphics even on your phone or a cheap laptop. You can also stream to YouTube in 4K, without any fancy capture cards. Everyone’s running a top-tier PC with Stadia. Developers are freed from the constraints of traditional hardware as well. Google talked about the potential for a thousand-person battle royale, once you’re freed from local machines and local Internet connections. They also talked about the potential for couch co-op to return, now that developers aren’t limited to running two compromised versions of a game on the same console hardware. And of course there are visual enhancements to be explored. Microsoft had this idea years ago—remember when Crackdown 3 was going to use the power of Microsoft Azure to simulate citywide destruction? Well, Google’s talking about Stadia doing the same, demonstrating realistic water simulations on its platform versus a local machine. It’s impressive. Lest I sound too repetitive though, let me say again: In. Theory. The problem with streaming is, as always, your Internet connection. I live in San Francisco, and thus don’t run into these issues often. We’re flush with data centers around the Bay Area, meaning latency to the server and back is never too bad. I’m also lucky to have Gigabit internet at my apartment as well. Stadia will probably work great for me. But if you don’t live in a major metropolitan area? It’s harder to say how this will go. Google talked up its infrastructure, and it is impressive: 19 regions, 58 zones, 200-plus countries, and 7,500 edge nodes. Chances are you aren’t too far away from a Google server farm. Stadia’s streaming nature means you’ll be able to join queues to play against your favorite YouTube streamers instantly, or send challenges to your friends tied to specific save states. Whether it will feel as immediate as playing on a local machine though? Whether you’ll be able to take advantage of 4K and 60 frames per second streaming, with HDR and surround sound? Whether it’s good enough for a high-level fighting game or first-person shooter play? These are important questions, and unfortunately ones we won’t be able to answer until Stadia is out in the world. Google did trot out id Software to say Doom Eternal will come to Stadia, which is certainly promising—but again, it depends on your home Internet connection. Also, if (as I do) you have a data cap? This is all a bit worrisome. I play hundreds of hours of games every month, and streaming yet another form of entertainment is going to put a lot of strain on my 1 terabyte limit. Unlike Steam’s streaming, there’s no option to install a game if you want. You’re always streaming it, and presumably copies sold through the Google Play store won’t come with more traditional versions from other storefronts. You’re either all-in on Stadia and streaming or you’re not. It’s pretty exciting though. Provided it works, it could shake up the entire industry in some interesting ways. Already, the Microsoft/Sony/Nintendo trifecta seems threatened—though of course, Microsoft’s set to reveal its own Project xCloud streaming solution sometime soon, maybe even as early as E3. There was more in the announcement. Stadia doesn’t need any specific hardware, and you’re free to use your existing mouse and keyboard or an Xbox or PlayStation controller. 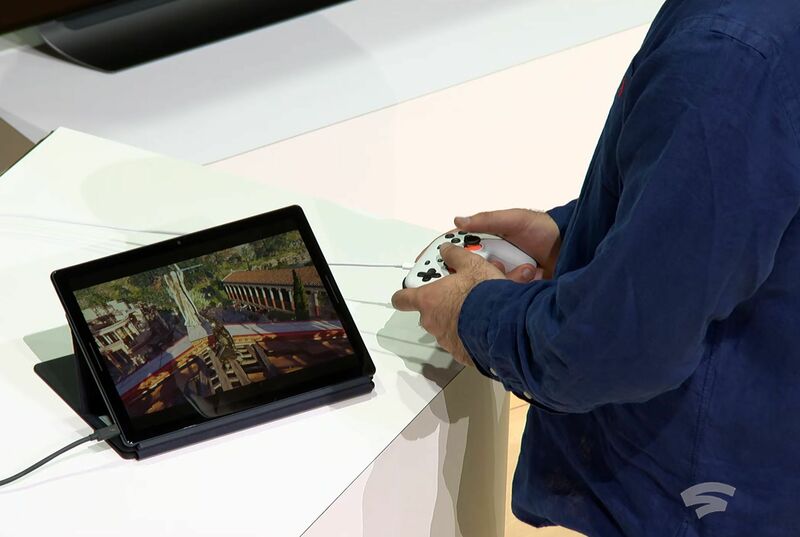 Google’s making a Stadia-specific controller as well though, and it looks similar to the mockups we saw floating around on Twitter last week—which is to say, not the most comfortable. I’ll reserve judgment until we’ve held one though, as that’s always hard to determine. And Jade Raymond came out onstage to say that Google will be funding first-party games, meaning at some point in the future we’ll see Stadia exclusives. It’s not a console, but the console mentality is very much alive. Most important, we got a “release date.” Stadia is set to release in the USA and most of Europe sometime in 2019. It’s safe to assume that’s the back half of 2019, as Google said we’d see more “this summer.” There’s a good chance we’ll see Microsoft and Google squaring off this holiday season, which means the next generation is really on the horizon—and looks a lot different than every generation to-date. Interesting times.